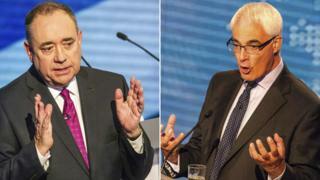 The second Scottish independence debate between Better Together's Alistair Darling and Yes Scotland's Alex Salmond is due to take place later. But what are the known unknowns - the questions both sides disagree on, but people want answered? Both the pro-union and Yes Scotland campaigns will be hoping the second live TV debate between the first minister, who fronts the SNP government, and Labour's Mr Darling will be their moment to shine. The 90-minute debate, which is being held in Kelvingrove Art Gallery and Museum in Glasgow, will be broadcast on BBC Two in England, Wales and Northern Ireland, and on BBC One in Scotland. Both sides insisted their man came out on top in the first debate on 5 August, which was only shown live on STV in Scotland, but was also broadcast online. A snapshot ICM/Guardian poll of 512 people immediately after the two-hour live debate found a majority thought Alistair Darling had fared better. Many other pundits agreed. However, John Curtice, politics professor at Strathclyde University, says the leaders' debate was not the damaging episode for the "Yes" side that it had originally appeared to be. Voters in Scotland go to the polls on 18 September - answering the "Yes/No" question: "Should Scotland be an independent country?" With the debate being watched all around the UK, what are some of the key questions people want answered? Currency has created one of the biggest deadlocks of the debate. Mr Darling has never wavered from his position that an independent Scotland won't be able to use the pound. His party, the Conservatives and the Liberal Democrats agree. However Mr Salmond sees things differently. He wants to continue to share the pound with the rest of the UK in a formal currency union. The first minister is convinced that would happen as part of negotiations with an independent Scotland, because otherwise, he argues, Scotland would be entitled to refuse to take on a share of UK debt. The former Labour chancellor spent much of the first debate asking Mr Salmond to set out his "plan B" but the first minister stuck to his view that "it's Scotland's pound too and we're keeping it". There are other options - the euro, a separate Scottish currency or Scotland goes ahead and uses the pound without formal agreement, which is known as sterlingisation. But the Scottish government has already said it does not favour the euro. Mr Salmond has repeatedly made clear sterlingisation would only be a suitable "transitional" arrangement. And he's said those who would prefer Scotland to switch to "our own currency" would have to win support for that in an election. Since the STV debate, Mr Salmond has said he wished he had explained his position "in more detail". A BBC poll has shown the economy and currency are key voter concerns. Watchers of the second debate will be hoping for some clarification. Daily question: What might a currency plan B look like? North Sea oil and gas reserves are another matter of much dispute. Mr Salmond says an independent Scotland would earmark a tenth of revenues - which the Yes campaign puts at about £1bn a year - to form a Norwegian-style sovereign wealth fund, creating a £30bn pot over a generation. Prime Minister David Cameron says the North Sea has been a British success story - and now oil and gas are getting harder to recover it's important to back the industry with the "broad shoulders" of the UK. Part of the problem is that oil reserves are running out, and even oil experts don't agree on exactly how much is left. The UK government's Office for Budget Responsibility has forecast that entire UK tax revenues from the North Sea will fall from £6.1bn in 2012-13 to £3.5bn in 2018-19. The Scottish government estimates that £5.6bn of the £6.1bn generated in 2012-13 was made in Scottish waters. Its predictions for revenue from the "Scottish sector" in 2018-19 vary between £3.2bn and £8bn, as set out in its Oil and Gas Analytical Bulletin, published in May 2014. But forecasting future revenue is complicated. It depends on factors such as how much oil and gas are extracted, the global oil price, the rate of taxation and the exchange rate between sterling and the dollar. There is also disagreement among the experts. Retired oilman Sir Ian Wood claims the Scottish government's predictions for North Sea oil recovery are up to 60% too high. However a report by N-56, which was founded by Dan Macdonald, who is a member of the advisory board for Yes Scotland, found future North Sea revenues could be six times higher than a UK economic watchdog had forecast. The figures have left many scratching their heads. Daily question: How much oil does Scotland have left? The suggestion that border controls might be needed in the event of an independent Scotland is also contested. The clash is the result of Mr Salmond's stance on immigration. He hopes to increase net migration into Scotland by 10% - from about 22,000 to 24,000 each year - after independence to expand the workforce to finance the state pension. The first minister argues an independent Scotland would not need border checks as it would continue to be a member of the current Common Travel area with the rest of the UK, Republic of Ireland, the Isle of Man and the Channel Islands. Home Secretary Theresa May has said she envisages "some sort of border check", while Ed Miliband says a Westminster Labour government would consider building border posts if Scotland voted for independence. The concern is that immigration rules for both sides of the border would not be the same, so people might travel to Scotland to move south. There is also some uncertainty around the Schengen Agreement. Neither the UK nor the Republic of Ireland is part of the Agreement - which allows passport-free travel between many other EU countries. However, all new EU member states are now required to join, so if an independent Scotland has to re-join the EU as a new member - as some suggest it would - it may have to sign up. As the UK has no intention of joining the Schengen area, border controls between Scotland and the UK might be needed to meet EU rules protecting the security of the Schengen area. Immigration often ranks second only to the economy in UK voters' concerns, with recent Ipsos-MORI polls showing it is now their top priority. Daily question: Would the Scottish border change post-Yes? The two sides disagree over whether an independent Scotland would be able to negotiate EU membership from its current position, or have to apply from the outside as a new member. In its White Paper on independence, the Scottish government claims an independent Scotland would be able to negotiate continued membership of the EU through Article 48 of the Treaty of the European Union. It argues that negotiations could be concluded in time for its proposed date for independence of 23 March 2016, meaning there would be no break in Scotland's membership. However, the UK government and Better Together campaign say Scotland would have to leave the EU and re-apply for membership as a new state under Article 49 of the EU Treaty, which could take several years. That stance has been supported by outgoing European Commission president Jose Manuel Barroso, who said it would be "extremely difficult, if not impossible" for an independent Scotland to join the European Union. But others such as Oxford University Professor Sionaidh Douglas-Scott have said it would be "relatively smooth and straightforward". The argument matters to the UK because if an independent Scotland is not part of the EU, its relationship with the rest of the UK might have to change in important areas such as trade, commerce and human rights protections. The UK's nuclear weapons system - currently made up of four Vanguard-class submarines which carry Trident strategic missiles - is another bone of contention. It has been based at HM Naval Base Clyde on the west coast of Scotland since the 1960s. The site is made up of two main parts - Faslane on the Gareloch, where the submarines are based, and Coulport on Loch Long, eight miles away, where the warheads are stored. Both Conservatives and Labour want a like-for-like replacement when the existing fleet ends its working life in the late 2020s, while the Liberal Democrats want to downsize to three submarines. The government says there are no plans to move the nuclear deterrent if Scotland votes for independence. However, the Scottish government says if Scotland votes "Yes" Trident will be removed - with the weapons' withdrawal by 2020 - and a written constitution would ban nuclear weapons from being based in Scotland. Work has begun on designing the next generation of submarines but a final decision on the exact nature of the replacement has been deferred until 2016, after the next general election, not least because the present coalition government disagrees on how to proceed. However, the UK government says no contingency plans are being made as to where Trident might go if an independent Scotland stands by its pledge. Daily question: What might independence mean for Trident? One thing these areas all have in common is that they could be used as bargaining chips in the negotiations that would follow a "Yes" vote.